At first glance, the Mazda2 looks a bit too small and cute for my tastes. It is a bubbly looking car, but not quite as bubbly as a Volkswagen Beetle or even a Toyota Yaris. Despite its cute nature though, the Mazda2 is still better looking than a lot of the subcompacts available in today's market. The Mazda2 my fiancee and I test drove was the basic Sport model, which comes with plastic hubcaps instead of alloy wheels. I have to admit that in all the cars I have test driven over the years, this is probably the only car I have seen that actually looks halfway decent with its plastic hubcaps. The wheels are small, but seem to fit well with the rest of the car's diminutive stature. 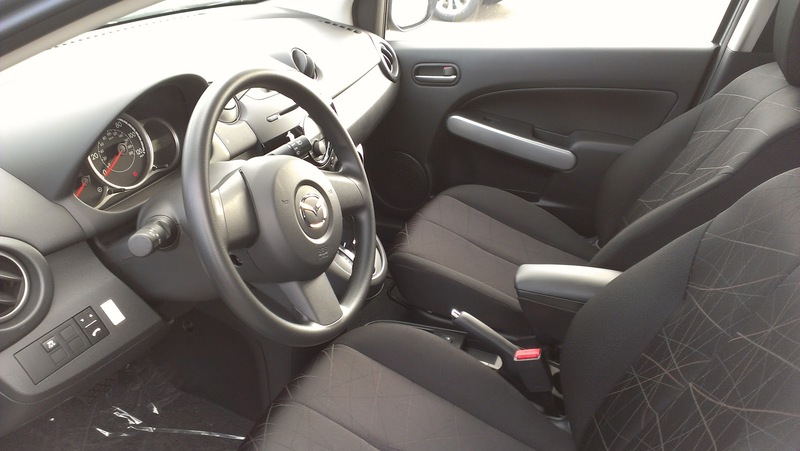 The inside of the Mazda 2 is relatively spartan compared to its competition. 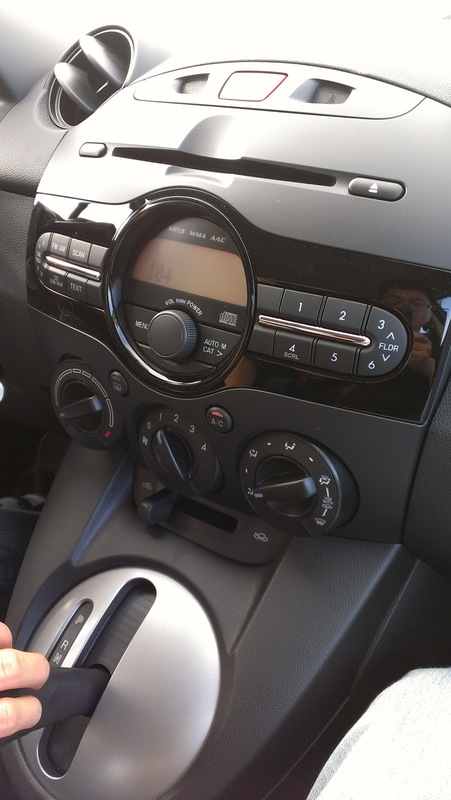 It does lack quite a few features that some of its competition has standard, such as cruise control, but for 2013, Mazda does add a USB port, although Bluetooth is an option, which was installed in this vehicle. 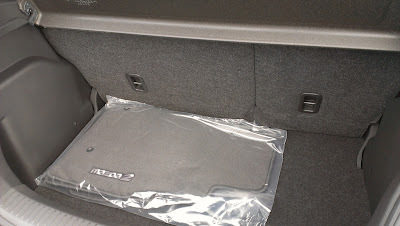 To make up for its lack of features though, the materials Mazda has used for the interior are top notch. All of the materials, from the cloth on the seats to the plastics covering the dash, had a pleasantly soft and high quality feel to it. The center stack is simple and clean, and the car just has an overall pleasant feel to it, funky cloth pattern and all. The Mazda2's engine is really nothing to write home about. It is a small 1.5 liter inline-4 making 100 horsepower and "whopping" 98 lb./ft. of torque. Power is transferred to the front wheels via an ancient four-speed automatic transmission. Honestly, this powertrain set up would only be capable of going fast being pushed off of a cliff. Even though it has a pretty nice sounding intake snarl, the Mazda2 feels incredibly slow. The slow shifting four-speed automatic certainly does not help things either, with downshifts bordering on being downright glacial and a bit clunky. The only positive I can think of regarding the powertrain is its decent fuel economy (29 city/35 highway), and even that is not all that impressive considering all of its competition makes more power and gets similar or better figures. Thankfully, the Mazda2's handling capabilities are far more exciting than its powertrain. The suspension setup definitely leans towards the sportier side of things, with very crisp handling, minimal body roll, and a distinct lack of understeer (though I am pretty sure the lack of power helps with the lack of understeer). Even though the Mazda2's suspension is tuned to be more sporty, it certainly does a decent job of soaking up bumps and uneven roads. I was actually quite amazed at how well the car handled despite the skinny, probably economy oriented tires. The Mazda2 also has what I feel is the best steering feel in its class. During the test drive, I was able to feel exactly what the front wheels were doing and where they were pointing. I think the only downside to the car's handling profile had to be the brakes. It is not that they were bad, but they certainly did not stand out in any way. Alas, this is a subcompact hatchback, so no amount of great handling will convince people to buy this car unless it has decent cabin space, right? Unfortunately, the Mazda2's cabin and cargo space are very lacking. While trying to get into the back, I managed to hit my head. The last time I did that was while looking at the Acura ZDX with its pointlessly sloped roof line. Even after getting into the back, I could feel my head hovering mere centimeters from the roof. One good bump in the road, and we would be halfway to a double-bubble roof. Leg room is also minimal. Even with my fiancee at the front, my knees were just brushing the back of the driver's seat. The fact that I am not that tall (5 foot 8 inches to be precise) makes this worse. As for cargo space, it would seem the Mazda2's lack of rear cabin space also has a negative effect on cargo space. Seats up, you are looking at a fairly paltry 13.3 cu.ft. of space. Seats down, space only grows a mere 14.5 cu.ft. for a total of 27.8 cu.ft. With its competition routinely breaking 50 cu.ft. with the seats down, the Mazda2 is in big trouble in this department. So, does the Mazda2 demonstrate Mazda's quirky, pioneering attitude towards cars? If quirky and pioneering are alternate terms for under-powered and tiny, then yes. While the Mazda2 handles better than most of the competition in the subcompact class, it is woefully under powered, cramped, and weighed down by an ancient transmission. The Mazda2 has been out for a while now, and as mentioned, is still in its first generation here in the United States. Hopefully Mazda will have a better subcompact entry when the second generation car rolls into dealer's lots. Would I recommend the Mazda2? Only if you value driving dynamics over everything else. It is a great handling car, but it just does not do anything else well. Even the nicely appointed and simple interior is not enough for me to recommend looking at this car. If you are looking for a subcompact, you would probably be better off with something else. 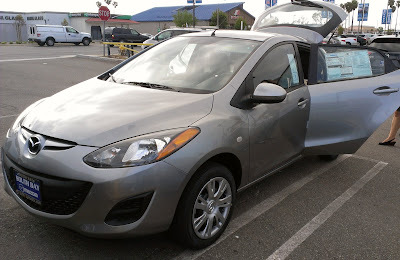 Besides the test drive that I went on with West Brother, I was able to spend a little over two days with the Mazda2 during a trip back to Sacramento. The extended time with the car allowed me to take a closer look and compare it to my current 2011 Honda Fit Sport. I know West Brother feels that the car looks too cute and bubbly to him, but I thought the Mazda2 Sport looked sleek and sporty. I also like that its shorter stance and smaller size makes it less prone to being pushed around by heavy wind. My Fit, being taller than the Mazda2, can get pushed around a bit when winds really start blowing hard. The interior of the Mazda2 was not something I enjoyed. During my initial test drive with West Brother, I thought it looked plain and boring. The materials were nice, but that was about it. During my trip to Sacramento, I was able to play around with the buttons and found that the radio controls were poorly laid out. In most cars, the preset radio station buttons are either all grouped at the top or the bottom of the radio. In the Mazda2, the preset buttons are all grouped to the right. Every time I wanted to hit one of the presets, I kept hitting some other function instead. I really enjoyed the way the Mazda2 handled, with its tight and sporty suspension. Acceleration was pretty much the same as my Fit, which means that it was decent with smooth upshifts, but still had some room for improvement. When we first looked at the Mazda2 at the dealership, both West Brother and I felt that the trunk looked really tiny and that rear space seemed limited. After spending about two days with the car, I can confirm that our initial suspicions were correct. At 5'2" and 105 lbs., I can sit in the back fairly comfortably. While trying to haul family and friends around though, things got cramped in the back real quick. Cargo space was laughable at best. During a stop, I opened the trunk and stared in awe at how little space there was. If I needed to go to Costco or help a friend move, this car would not be very helpful. But hey, at least the seats are comfortable and the rear headrests are nice! 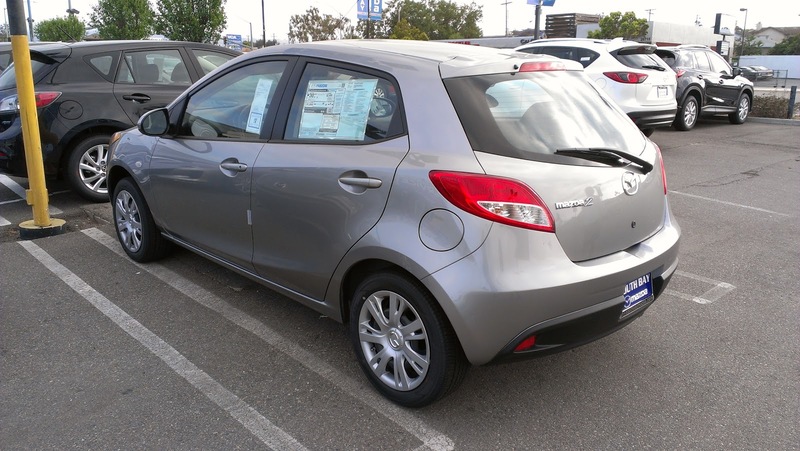 Had I not already purchased my 2011 Honda Fit Sport when I was actively looking for a new car, I may have considered the Mazda2 Sport. After owning my Fit for over two years now, I doubt that the Mazda2 would be a car that I would even consider. It is a fun car to drive, but do not plan on having more than one additional passenger, helping someone move, or making large purchases. *Special thanks to South Bay Mazda for letting us test drive their car!